2 bedrooms with Queen beds and 1 bedroom with 1 king single and 1king single beds, down the corridor, there is a large bathroom with toilets, shower, and 2 person bathtub. The lobby, laundry, another toilet, outdoor private shower running with hot water, and the 4th bedroom with a Queen bed which access at the back of the house with a small garden, and parking. The garage will be locked and private at all time. - Linen, you can bring your own and save. to rent one let us know. - Library book swap under condition. We are a small family of 4. Built in the in the 70th it wasn't just the colour scheme to change over the years we worked hard and kept going to just make it looking better. We were looking at a place we could call home, our first home. It is so close to the town, easy access, school, shops, and more... a walking distance. We just love it! Free off street parking for boats and cars, great private and relaxed front yard, with BBQ. Close to town. 1 Large bathroom with large bath and shower plus outdoor shower running with hot water. 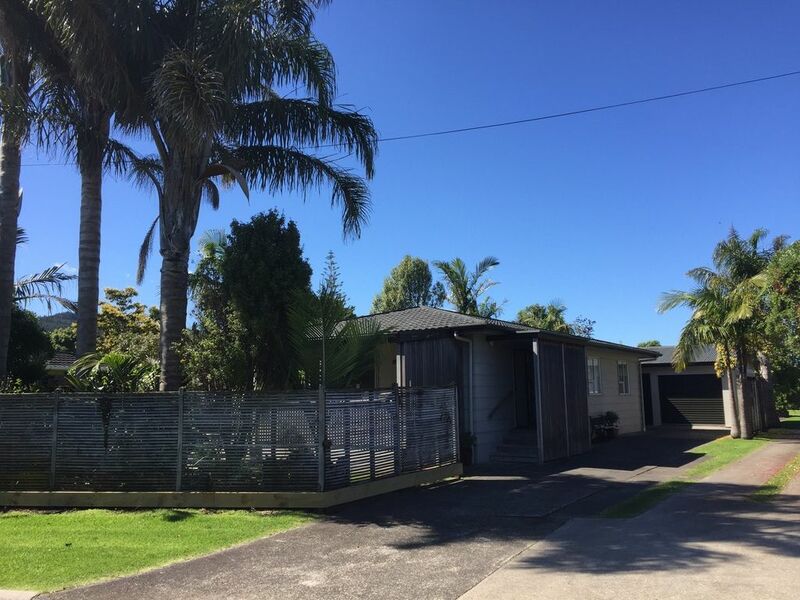 In the heart of Whitianga easy access, walk, cycle along the Estuary reserve, or the Marina landing to the down town, so close to shops and restaurants. Great and easy walk for people of all age. A walk away about 15 minutes to Buffalo beach few minutes driving to many other well-renowned beaches of the Coromandel, Hot Water Beach, Hahei, Opito. Snorkling, safe swim, easy access. Surrounded with hills and the Estuary. 100m walk toward the Estuary nice and easy access walk all along Robinson Road, dog friendly. Only in the lounge, can be used if all the windows are closed. It is not compulsory you can bring your own and save, must be arranged with the owner-manager. Free parking up to 4 cars, safe boat parking, easy access. Wireless Wi-Fi free internet, High speed. You have to provide your own if haven't booked for linen. Please bring your own beach towel. It can be provided by the owner-manager if needed. Large open living area 60m2, seating up to 8 people, comfortable study area. indoor and outdoor. Outdoor and indoor dining area, can seat up to 10 people. Child high chair on request. Smart TV 50inch, FreeView, Netflix. Few board games to share with family and friends, of all age. Free parking for a large boat on trailer. Just a minute drive/walk and easy access to the boat ramp on Robinson road. Whitianga is providing a wide range of boat trips which can be booked online. Extra outdoor leaving/dining and lounging areas. Can be leased at the Dive HQ sport shop. Community Tennis court - 2 minutes walk, not far from the house can be used if not busy. Racquets not provided. A few minutes walk to the Mercury Bay Area School pool open to the public which is supervised over the summer holidays only. Excellent place to stay. Like being at home. Everything you could want has been thought of. We had a water pipe burst in our street and the owners were amazing - brought around big bottles of water at 7am! Luckily the water was restored at lunchtime so it didn't ruin our trip. House is very comfortable, warm, clean and lots of thoughtful touches like games and books to choose from. Great outdoor living and furniture. One of the best book a bach's I have ever stayed at. Highly recommend and would stay again. As a family we found we were really well catered for. Lots of lovely areas to sit and relax. Enjoyed the front deck and the private feeling front garden. Very handy and town only a short walk away. Outstanding property, with every detail carefully thought oit. Beautiful garden and close to the water. We loved this place. Modern, immaculate. So many lovely touches. This house was the best presented and modern house that we have stayed in. Our house is located nearby the Estuary, few minutes walk to the town center and all amenities, visit the Marina on your way. You will find the information center, shopping, restaurants, and many different activities. Easy access, short (2minutes) drive to the Robinson road boat ramp and another boat trailers parking. A few minutes to the Lost Spring. Just 500m walk from our house the Area school has the swimming pool open to the public for people of all age supervised during the Summer school holiday, walk or bike along the estuary have multiple discoveries on Robinson road. Love it! relax during the evening with a BBQ/dinner (with meat from our local butcher top of the line) to our big open and spacious outdoor and indoor comfortable leaving area, quiet, safe, music on, easy access, free parking, free Wi-Fi. A seat for everyone. Drive 30 to 40 kilometers to Hahei Cathedral Cove, Hot water beach, and few other beautiful beaches or go to the historical and picturesque Coromandel town, the 309 Road with many different activities, water holes, waterfalls, day walks, The Kauri Grove, restaurant and water garden with a restaurant, 309 Honey find some Homemade Manuka Honey. In Whitianga and surrounding area 4 Golf courts, fishing, artist exhibitions, horse riding, sea kayak, paddle board, banana boats, sailing, animal farm trips, museum, historic sites, many different walks, ferry landing with restaurants. And during the summer the Coromandels is offering Festivals, farmers markets, concerts, it is all advertised and programs can be found online, Isite or All about Whitianga.